Fresh herbs are a great way to flavor foods that are made from scratch. Fresh herbs are far better than a store-bought option that is typically dry. The reason is dry herbs have a taste that is somewhat different from fresh herbs. If you want to use fresh ingredients when cooking, then knowing the best way to store fresh herbs is crucial. The main concern with fresh herbs is that they will start to go bad in a few days. This is because there are no additives or chemicals being added. However, there are various ways to store fresh herbs and lengthen their viability for extended use. The first thing to consider is the types of herbs that are available. Common herbs will include cilantro, mint, and basil. There are many creative ways to store fresh herbs. However, you can also find various ways to use any herbs before they go bad. One option that is the most useful to store fresh herbs is to freeze them. This can be done any time you have extra herbs that cannot be used immediately. If you store fresh herbs in your freezer, then all you will need to do is thaw or melt them when they are needed. You can freeze fresh herbs using many methods. Herbs can be added to water to freeze or you might want to consider vacuum sealing. 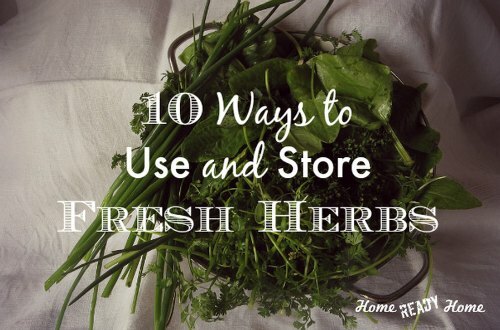 The ability to store fresh herbs successfully means the fresh flavor is retained. This is a great option for anyone who grows these plants in an apartment. Dehydrating is another method to store fresh herbs. Fresh herbs can be used in many ways and are not simply for flavoring foods. Herbs can be used to make a marinade or herbal tea. The various options you have available will depend on your personal preference or immediate needs.